In 2010, the Catholic Independent Practice Association was the largest network of independent practicing physicians in Western New York, with more than 900 primary care and specialty care physicians. Established in 1996 with an initial focus of integrating the efforts of five distinct physician-hospital organizations, leadership no longer believed that the organization’s name truly reflected the growing leadership role it had assumed in population health management and bringing true healthcare reform to its patients and the greater Western New York community. The team of Pantano & Associates and Telesco Creative Group were retained to lead a complete integrated re-branding and strategic communication effort that would be targeted to both internal and external audiences. 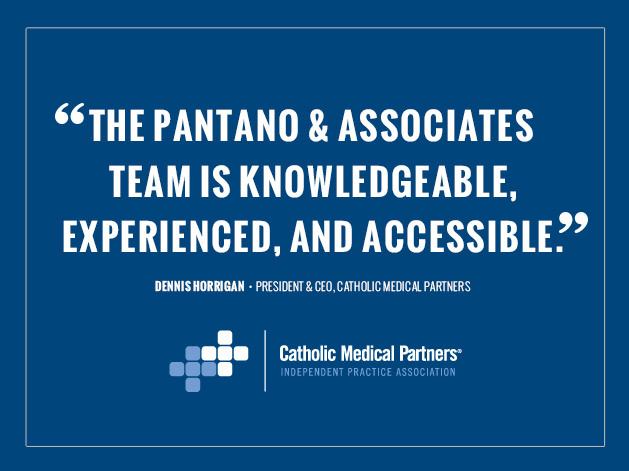 After engaging groups of physicians in a series of focused discussions, the Catholic Medical Partners brand was unveiled to the organization’s members at their 2011 Annual Meeting. Initial roll-out included an internal launch video, re-branded annual report, a brand brochure and member materials, and introductory press kit. Along with the re-branding, we established and executed a comprehensive communication program to ensure that all Catholic Medical Partners communication to all audiences, including members, health insurance providers, elected officials, and the media, had a consistent voice and tone. With the new brand reinforced internally, our focus expanded to include external communication efforts, such as print, broadcast, outdoor and digital advertising, to go along with continued proactive media relations to strengthened the Catholic Medical Partners brand. Copyright © 2014 Pantano & Associates. All rights reserved.